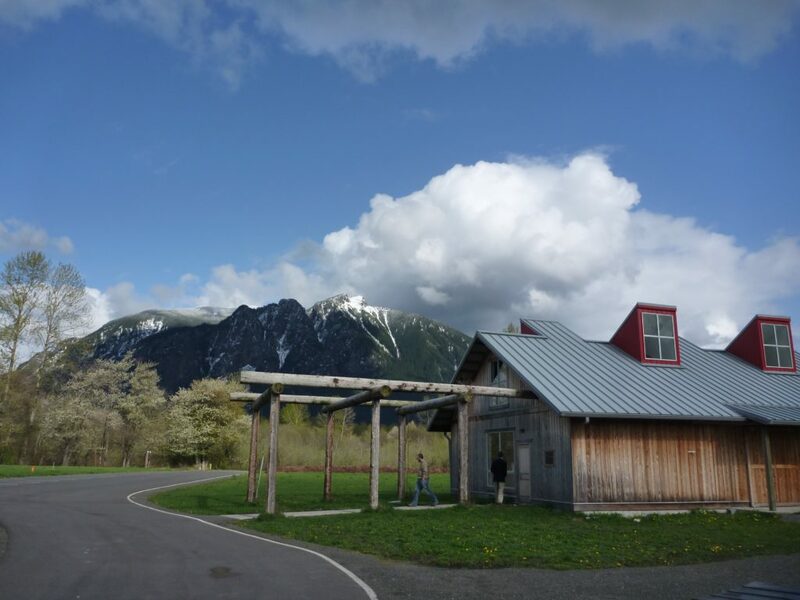 Meadowbrook Farm is an important story location to the Snoqualmie Tribal people, historically maintained as a prairie through traditional methods. It is a beautiful 460-acre open space located on the border of North Bend and Snoqualmie. It is known for the sweeping views of Mt Si and the elk that are often found munching in its fields. Meadowbrook Farm is full of interesting features that could easily fit a day. This itinerary will lead you through historic spots, art installations, and beautiful scenery. You can also use this map to help guide you along the way. The round trip is approximately 2.5 miles. Start your journey at the Meadowbrook Farm Interpretive Center, a beautiful building that combines elements of the cedar-sided Native American longhouses and sturdy pioneer barns that once stood on this land. Designed by Fall City architect Pat Fels, the Interpretive Center provides a versatile all-weather site for classes, meetings and special events, and houses an exhibit of historic photos from Meadowbrook Farm’s past. Also, in the center are five cedar-carved house posts, including the “Spirit of Salmon” carving which represents the importance of salmon and clean water to the Snoqualmie people. You can read more about the carved houseposts here. On your way out of the interpretive center you’ll notice hops growing up the posts at the entrance to the center. These plants harken back to a time when Meadowbrook held the title of the largest hop farm in the world. During this time, in the late 1800’s the property was owned by the Hop Growers Association, tending 900 acres with hop kilns for drying, camps and housing for workers, barns, and a three story summer hotel. Read more about the rise and fall of the “hop craze” here. Next, head northwest on the trail that parallels Highway 202. About 1,500 feet down the trail you will notice a “moo-thru”, an under-road crossing that was built to allow cows to safely cross under the highway. Just beyond the moo-thru you can look across the highway to a large rock. This rock, known as Swing rock, is a giant boulder that is part of the Snoqualmie Tribe’s oral history of the Snoqualmie Valley. Their oral traditions say that the giant rock between North Bend and Snoqualmie are the petrified remains of a rope swing that stretched from Mt. Si to Rattlesnake Ridge. Early pioneers named it Quarry Rock and decimated this culturally important landmark through excavation and quarrying for road building. The excavation has continued for many years and the scars of this destruction are still visible today. Continuing on the trail, you will head into the Meadowbrook Farm Central Meadow, a popular spot for the local elk herd. The elk in the Snoqualmie Valley are transplants from Yellowstone National Park. The native elk were essentially eliminated within about 50 years after European settlers arrived in 1858. A county game warden, supported by the local Elks Club, arranged to have 44 pregnant female elk shipped in a boxcar from Yellowstone National Park to Snoqualmie, where they were met by the Elks Club. Read more about their story here. Early morning and twilight are a great time to see the elk. If you come across the herd be sure to observe them from a distance (especially during mating season), never come in between a mother and her offspring, and leave your pets at home. If you aren’t able to see the elk in person you’re sure evidence of them all around. Look for tracks, scats, antler rubbing on trees, hair or branches or fences, and bugling calls in the fall. Continue on the trail as if curves to the right. After a few hundred feet you’ll come to a great viewpoint of the many surrounding mountain peaks and a sign with a series of blades indicating the mountain names and elevation. Continue on the trail through some woods where the trail will become more primitive. After crossing a foot bridge you will head into the Meadowbrook Farm Camas Meadow, that gets its namesake from the Camas lily. Camas is beautiful purple lily plant that is an important traditional food. The bulbs, which look like onions and taste like pumpkin, are harvested soon after flowering and are usually steamed in pits for 24 hours or more. The cooked bulbs could be served right away, or dried for trade or storage. Historically Camas could been seen growing in this meadow, although most of them are gone today. Continue on through another wooded section to the scout meadow. Head along the green fence line to get to restrooms and a playground at Centennial Fields. Continuing on the fence line will also connect you to an asphalt trail which you can take to the right to continue on the walk in Meadowbrook. You can also opt to cut through the meadow and pick up the trail further on, just head towards Mount Si. Continue on the trail over a foot bridge and a series of boardwalks that cut through a beautiful wetland. Be on the look out for birds and wildlife as you enjoy this scenic section. Cross one more footbridge and you’ll see the Dike Road Kiosk. At the Dike Road Kiosk head east and cross Boalch Avenue where you’ll pick the trail back up. Continue on the trail for a short walk to the Marie Louie Project commemorating an early Snoqualmie medicine woman. A set of ‘articulated’ cedar posts, laid out in the meadow marking the direction of sunrise through the calendar cycle, can be viewed from the watching place. Calendar terms in Puget Sound Salish are keyed to events in nature, like the ripening of berries, and the time to put away paddles at the beginning of winter, rather than mathematical monthly dates. The installation features 11 cedar markers, each painted a color corresponding to a seasonal period. The semicircle of cedar posts is laid out such that it follows the sunrise swings through its 80 plus degree arc at our latitude. Read more about the installation and the life of Marie Louie on the interpretive signs on site or here. Soon a trail will continue past the Marie Louie art installation and will connect with the Snoqualmie Valley Trail. This connection will allow Meadowbrook Farm visitors to easily access the trail to the Big Cedar at Meadowbrook Farm, a 9 ½ foot diameter, 500 year-old tree. For now, a visit to the Big Cedar will require a short drive to North Bend followed by a 2-mile roundtrip hike. Head back towards Boalch Avenue and cross the road. Take a left to return back to the interpretive center. You can also continue your tour with a visit to the Snoqualmie Brewery and Taproom in historic Snoqualmie. The family-friendly brewery makes a special Meadowbrook Farm Ale in the summer time, using hops grown at Meadowbrook Farm, but this famous ale goes quick.